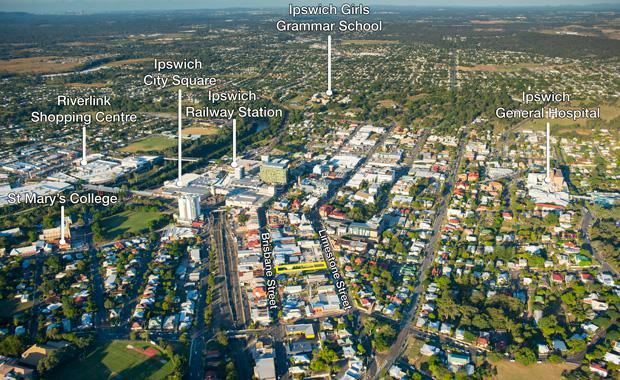 Adjoining lots with development potential in the middle of the Ipswich CBD are being offered for sale by Ray White Special Projects on behalf of Receivers and Managers. The property at 182 Brisbane Street, Ipswich, is being marketed by Ray White Commercial Queensland’s Andrew Burke and Matthew Fritzsche under instructions from Shaun McKinnon and Graham Killer of Receivers and Managers Grant Thornton. Mr Burke said the two approximately 809 sqm blocks are being offered individually or in one line and there is an existing approximately 183 sqm building on the site. “The property is zoned for various uses including residential, retail, offices, hotels and entertainment, restaurants, service stations, car parking, community and creative industries,” he said. Mr Fritzsche said the property is centrally situated in the Ipswich CBD and enjoys dual street frontage and exposure and can be accessed by either Brisbane or Limestone streets,” he said. “The site is close to retail amenities, hospitals, schools, the university campus and public transport,” he said. Mr Fritzsche said the existing building is suitable for retail purposes and could provide holding income if leased by a potential purchaser. Expressions of Interest close at 4pm (AEST) on Wednesday, August 17, 2016.